The United States is facing some very serious problems—catastrophic debt, destructive spending, nearly non-existent economic growth, high unemployment, super-high gas prices, a stalemate despite our military engagement in Libya, the Middle East in flames, complete with tyrant-directed slaughters and the rise of the Islamists, Iran’s continued march toward nuclear weapons, the growing assertiveness of China—-all of which I discuss here, on television, and on my radio program. The U.S. economy is moving sideways. While there are some signs of life, the most important indicators are very weak. Economic growth slowed to a 1.8% annual rate in the first quarter of this year, down from 3.1% of last year’s 4th quarter. If you exclude inventories (which picked up), the economy actually only grew by an anemic .8%. National Security Adviser Tom Donilon published an opinion piece on the administration’s efforts toward global nuclear disarmament — a presidential priority. We just got four swell pieces of information. The “freedom revolution” in Egypt has taken yet another ominous turn as “tens of thousands of Egyptians led by hard-line Islamists escalated their protests Friday over the appointment of a Coptic Christian governor in southern Egypt,” Association Press reported. Permanent link: Whose revolution is it, anyway? If the headline were “32 more corpses found in Israeli pits, total at 177,” I think we all know the kind of worldwide outcry there’d be. For years, the Left loved it when protesters got in the faces of President Bush, Vice President Cheney, Defense Secretary Rumsfeld, Secretary of State Condoleezza Rice, and others in the Bush administration. They relished the idea of Cindy Sheehan perpetually reclining on her lawn chair near the Bush ranch. They ate it up when Code Pink stormed Secretary Rice at a Congressional hearing. They guffawed when Bush got called a “war criminal,” “Hitler,” and “evil” while being hung in effigy. For those of us who didn’t realize it before, the 21,000 Chasidim in the community of Kiryas Joel are a serious threat to our economy, at least by the standards of the New York Times which featured a front page article, accompanied by a color photo of their children on April 21rst. These rascals in training are the main reason that the community qualifies for government assistance: the birth rate averages six children to a family which means that even families which earn more than the poverty cutoff may be entitled to food stamps and other benefits. Sam Roberts, the reporter, notes that there are plenty of cars and bikes and carriages in the community and nobody looks bedraggled, so without actually stating that these people are cheating the public, he wink-winks his readers as to what’s really going on. We all know that those guys with yarmulkes are genetically gifted at extracting money in dubious ways - just look at the swarm of little boys with their little right hands in grab-ready position. Just look at the infants in their bassinets on page 22 - you can almost see the legal tender floating through their tender little dreams. Five months after most U.S. voters sided with Tea Party philosophy by rejecting big government and big spending at the polls, Democrats are still charging that their losses were not based on policy but on racism. It should not be a surprise that Americans are losing their faith in Capitalism as they mistakenly identify it with the recent highway robbery of tax payers practiced by so called Capitalist states. For the socialization of private loss and the bout of Fed money printing is nothing less. Unfortunately, the only place tax payers were in a position to prevent their government from such action is in Iceland and they said no. FT editors are right. Other countries should follow Iceland’s example. The Syrian uprising is roiling Tehran. Syria is the country’s major ally. That is the reason that after cheering demonstrators in Tunisia, Egypt,Yemen, Bahrain and Libya, Iran blames Jordan and Saudi Arabia for Assad’s troubles. An Arab uprising in the oil producing Iranian region is always a threat. The recent Explosions in three oil pipes in Qum could be harbinger of things to come. Unless you’re big into baba ghanoush or eggplant parmesan, you may not be aware that eggplants are nearly impossible to find these days and have been for the past several weeks. I got the following quote via a 2009 email from Doris Wise Montrose, president of the Los Angeles chapter of Children of Jewish Holocaust Survivors, linking to a related J-Post article. I was a little surprised to see the Associated Press story this week actually lead with the fact that a missile fired from Gaza hit an Israeli school bus instead of with the results of Israel’s inevitable response. Weeks ago, I predicted that the chances Egypt would come out of its implosion as anything resembling a democracy are extremely slim, and I hate to say I told you so, but, well, I told you so. Permanent link: As goes Egypt …. The featured obituaries in the NYTimes of April 7th review the lives of three Jewish men, ages 85, 86 and 90 who all were born and raised in Brooklyn and all went on to great achievement in their respective fields. Baruch Blumberg (85), became a Nobel laureate in the field of biochemistry but was also a medical anthropologist. He discovered the virus that causes hepatitis B and helped to develop the vaccine against it. He was a graduate of Far Rockaway High School which has the distinction of schooling two other Jewish Nobel prize-winning alumni - Richard Feynman and Burton Richter. W.H. Prusoff (Bill, 90) was a pharmacologist at the Yale School of Medicine who, along with a partner, developed the first anti- AIDS drug. Prior to that, he synthesized a drug to treat infant keratitis, a major cause of blindness. For his work on these and other drugs, Dr. Prusoff is referred to as the father of anti-viral chemotherapy. His parents were immigrants who ran a small grocery store so Bill undoubtedly went through the Brooklyn public school system until he went to college. Stanley Bleifeld (86), a sculptor whose works are found in American museums as well as the Navy Memorial in Washington, was similarly a product of the Brooklyn school system. He grew up to be a man who sculpted military men and the great baseball players who are immortalized in the Baseball Hall of Fame in Cooperstown. Last month a Croatian war criminal named Azra Basic was arrested in Kentucky for torturing and murdering Serbian civilians taken prisoner by her army brigade in Bosnia, where she was some sort of commander. Egyptian Israeli peace treaty is much more popular in Egypt than we were led to believe. 63% of the Egyptians polled support it while only 14% oppose it. So, the Egyptian “street” is much less belligerent than MSM or the Egyptian intellectual elite would have you believe. I can hardly imagine better news. Egyptian elections are upon us and I hope against hope that this poll would diminish the candidates’ appetite to base their campaign on Israel bashing or threats to stop honoring the treaty as the wily El Baradei did recently. WILL NATO SURVIVE FAILURE IN LIBYA? Justifiably or not, the narrative during the Bush era went thus: Nato is able and willing but arrogant USA has little faith in the capabilities of its allies. Permanent link: WILL NATO SURVIVE FAILURE IN LIBYA? One of the many blessings of running my own accounting firm are the relationships that I build with people I would have never met otherwise. After running in the Republican primary for my congressional district last spring, I had yet another group of incredible new friends and partners. Through some of those new friends, I was put in touch with an American businessman living in Japan who had an absolutely incredible story of how the recent tsunami had affected his life and the lives of those closest to him. Here they go again. Once again, we are faced with a president and members of Congress running around with their hair on fire. The website of the Cageprisoners human rights organization beloved by Amnesty International and supported by Quaker charities, is by proud definition, an apologist and advocate for terror. Today, as the UK’s leftwing anti-terror site Harry’s Place points out, Cageprisoner’s researcher Ayesha Kazmi deplores the King hearings, the anti-Islam “witch-hunt” going on at the King hearings, and other cliches. Goldstone afraid to meet his maker? 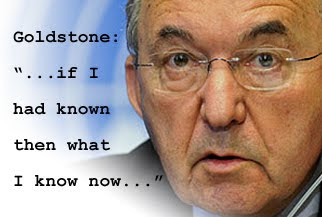 Infamous Goldstone has admitted that there was a difference between Israel and Hamas. Israel did not intentionally target civilians in the Gaza war as the UN report carrying his name alleged while Hamas did. Permanent link: Goldstone afraid to meet his maker? Which is the Worse Case Scenario? As the Libyan “kinetic military action” grinds on, it becomes increasingly likely that we will get one of two outcomes. It’s possible that we might get a great outcome: that Qaddafi steps aside without too much more bloodshed, that true democratic reformers take control, and that al Qaeda and the Muslim Brotherhood are effectively sidelined. While that result is possible, it’s not likely. So let’s examine the two most likely scenarios. Permanent link: Which is the Worse Case Scenario? Interesting, isn’t it, that Tunisia’s government is all bent out of shape because the Israeli government is offering about $9,000 extra to Jews hoping to leave the protest-torn North African country and immigrate to Israel, JTA reported.